Built on top of @angular/cli, @ng-bootstrap and @angular/material. After working for almost two months, we are finally releasing the Angular 7 version of our popular ArchitectUI Admin Dashboard Theme. It features a fully responsive layout, modern components, updated to their latest versions available. ArchitectUI Angular 7 makes it easy to modify, integrate or adapt to new and already built applications. It’s built upon @angular/cli, so bootstrapping a development instance should be a breeze. The main framework evolves around @ng-bootstrap and @angular/material, making ArchitectUI Angular 7 very powerful in terms of components and customization because it contains not only Bootstrap 4 elements and plugins, but also Angular Material Design components. Get your ArchitectUI Angular 7 Dashboard PRO copy today, with 30% discount. Use angular7LOVE coupon code at checkout. There are only 50 discount coupons available, so hurry! Each of our themes come bundled with at least 3 different layouts arrangements. For example, ArchitectUI Angular 7 Dashboard PRO includes a sample Mailbox, FAQ Page and Chat dummy applications. 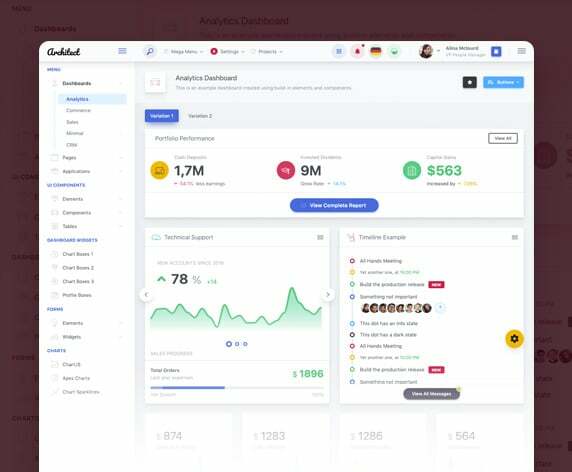 ArchitectUI Angular 7 Dashboard PRO has 9 different dashboard designs included and fully coded that were built using only the included components and elements. You could easily merge together parts from existing dashboards to create brand new unique ones. ArchitectUI Angular 7 Dashboard PRO works great on any screen size. From low-end mobile phones to Retina displays, it loads and acts perfectly. ArchitectUI Angular 7 Dashboard PRO has it's own documentation files accessible either on DashboardPack.com or locally in the downloaded theme .zip archive. ArchitectUI Angular 7 Dashboard PRO comes with it's own individual documentation files available both online and offline in the .zip archive. ArchitectUI Angular 7 Dashboard PRO is available on a private Github repository for all buyers. If you have a quick question, you can join the ArchitectUI Angular 7 Dashboard PRO Slack dedicated channel. Submit issues, questions or support requests in our ArchitectUI Angular 7 Dashboard PRO dedicated support forum.